When it was conceived back in 1993, the UFC had a simple purpose: to prove how superior Brazilian Jiu-Jitsu was in comparison to all other fighting styles. Royce Gracie shocked the world, finishing his first 11 opponents in the Octagon and showing that with that kind of skill, weight and power weren’t determinant aspects of a fight. Today, all MMA athletes practice grappling and BJJ, but there are still moments when, as the most passionate practitioners of the sport would say, only jiu-jitsu can save you. On our countdown to UFC Sao Paulo, we’ll revisit moments that highlighted previous events in the city in a five-piece retrospective. In this chapter, let’s look at the top five submissions. Ildemar Alcantara proved exactly how to overcome physical disadvantages in his UFC debut in 2013, when he faced the heavier and stronger Wagner Prado and came out with a win after escaping a guillotine choke and finishing with a beautiful kneebar. 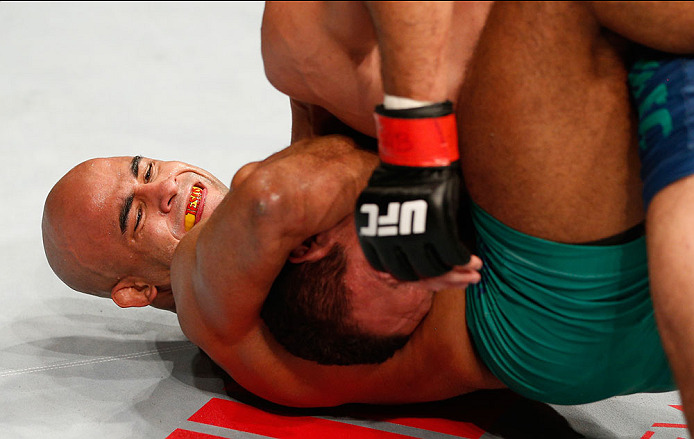 Another fighter who debuted with a submission win was Warlley Alves in 2014. In the final round of the middleweight tournament of TUF Brazil 3, he showed, for the first time in the Octagon, what all of his teammates already knew: his guillotine is one of his best moves. 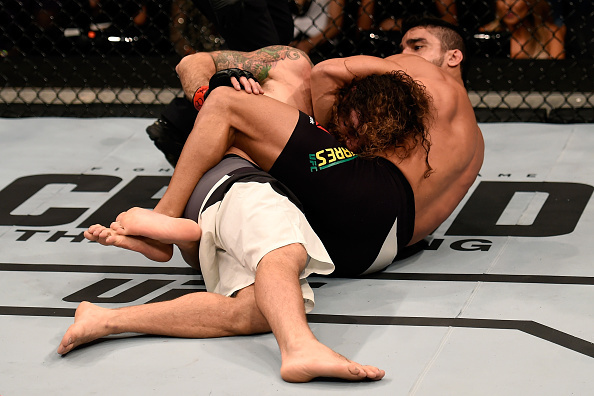 The fight between Thiago Tavares and Clay Guida was expected to be long and close, but it ended in only 39 seconds after a takedown attempt by “The Carpenter” turned into a guillotine choke finish by the Brazilian. Another great Brazilian grappler who is known for his efficient guillotine choke is bantamweight Pedro Munhoz. By the time he fought Justin Scoggins in 2016, the Sao Paulo native had already finished four fights with this move in his career, so when he saw Justin’s neck unprotected, he didn’t think twice before going for it and making it number five. Besides Brazil, another country which has a long tradition in grappling is Russia, where Gadzhimurad Antigulov came from to Sao Paulo in 2016, and he silenced the home crowd by finishing his Brazilian foe in the first round.